The Kuching Orchid Garden, located next to the Governor�s Astana, opposite the Kuching Waterfront, makes part of the city banks bloom with beauty. Located in a park, the Orchid Garden serves as one of the city major tourist attraction offering both horticultural and botanical interests. 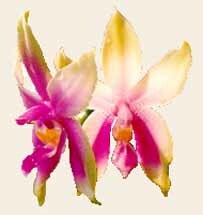 The orchid garden boasts a magnificent collection of 79,000 mother plants comprising 112 species and hybrids of orchid. The park is developed and managed by Kuching North City Hall. 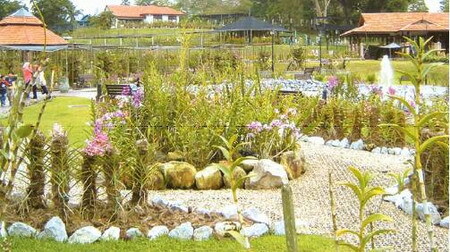 The Kuching City Orchid Garden project is made up of Nursery and Garden displays. Most of the collections here are an exquisite variety of Borneo species consisting of epiphytic and terrestrial orchids, planted in the open, shaded or semi-shaded areas. Among the famous Borneo Orchids found in the garden were the Lady Slipper (Paphiopedilum Sanderianum), Caelogyne Pandurata (a unique green and black-flowered orchid), Bulbophyllum Beccari (a species which releases an unfavourable smell), Vanda dearej (fragrant flower) and the Phalaenopsis Violacea (commonly known as Orchid Normah) which was declared the state flower of Sarawak on Aug 28, 1983. 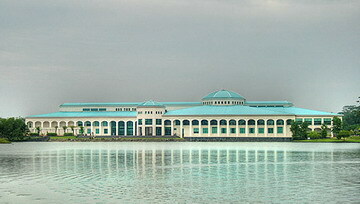 Housed in an elegant modern neo-classical building across river in Petra Jaya, is probably the most technologically advanced public library in the region; extensive databases contain almost everything you could want to know about Sarawak. Library use is by membership only, available to visitors for RM5 per week, although non-residents may not borrow books or other materials. The Library has a strict dress code. 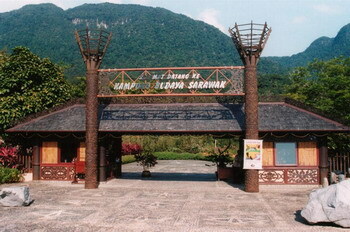 Tucked away on the foothills of legendary Mount Santubong, 35 kilometres away from Kuching is Sarawak's fascinating cultural showcase, the award winning "Sarawak Cultural Village". Aptly named, a �living museum? it depicts the heritage of the major racial groups in Sarawak and conveniently portrays their respective lifestyles amidst 14 acres of tropical greenery. Here, it is possible to see Sarawak's ethnic diversity at a glance. The handicraft is both bewildering and tempting, including the Kain Songket (Malay cloth with gold inlay), Pua Kumbu (Iban housewives textiles), Melanau Terendak (sunhat), Bidayuh tambok (basket), Iban parang (swords), Orang Ulu wood carving and Chinese ceramic. The 45-minute cultural performance of songs, dances and entertainment is something you will not want to miss out during your visit to Sarawak. The best place in Sarawak to view semi-wild orang utans, who have been rescued from captivity and trained to survive in the surrounding forest reserve. The rehabilitated animals roam freely in the rain forest, and often return to the centre at feeding time. 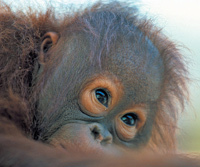 Thanks to the successful breeding programme at Semonggok there is a good possibility of experiencing one of the most heart-warming sights in Borneo - an orang utan mother with a young baby. 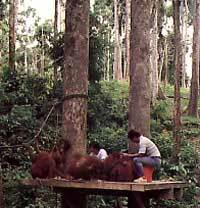 The Semenggok Orang Utan Rehabilitation Centre provides a rare opportunity to be at close range with the �Wild Man of Borneo?and to observe their behaviour and activities in their natural habitat. Before arriving at the feeding center, you will have a brief experience walking through the amazing untouched rainforest. On the return trip, you may opt for a short trek along some trails in this Semenggok Nature Reserve. The centre is a 30 minute drive from Kuching and another 20 minute by foot into the jungle. Along the way visitors pass by the ethno-botanical gardens, with their unique collection of rain-forest plants. 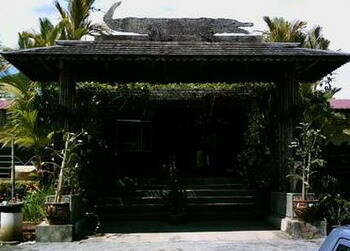 The farm is located about 29km from Kuching City and takes a 40 minute leisurely drive to reach. The farm is one of the largest crocodile breeding farms in the country with a population well over 1000. Set amidst the tropical fruits trees and lush greenery is a home to over 1,000 crocodiles. It serves as a perfect sanctuary for these fearsome reptiles where they are kept in an enclosure designed and built similarly to their natural habitat. Apart from the crocodiles, it also houses other wildlife such as the bear cats, civets deers, pytons, hornbills, gibbons and other fascinating animals which are found in Sarawak.